The concept of an endless runner is simple. You run until you die. Despite their simplicity, endless running games are among the most ubiquitous and popular games in the App Store. This AppGuide looks not only at "runners" in the strictest sense but also at games which capture the spirit of the endless runner. These include games with other types of endless motion, as well as endlessness in dimensions other than the horizontal. Here we have some great news for all of you guys who are looking for a new and challenging game for great entertainment. The game app that we found is called Catchy Monkey, a proposal of the game that will conquer your heart with addictive game play, an endless running concept that hypnotizes and puts in hours of enjoyable entertainment. 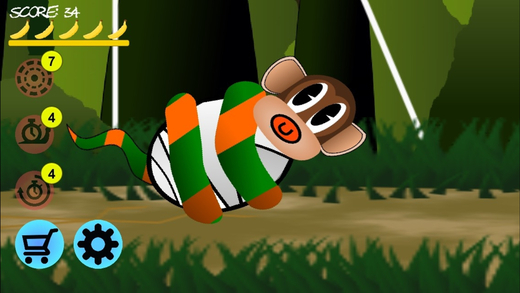 The main target in Catchy Monkey is to keep the baby asleep while you’ll run through the jungle, try to avoid the obstacles and helping the snake carry the young monkey out of the jungle. The real challenge is to run through the jungle far as possible in order to make more and more new high scores. Every new record you can share it with the friends on social media. The endless swing game features with charming colorful graphics, lovely cute game characters, and entertaining sound effects. Catchy Monkey is free for downloading and available on App Store.